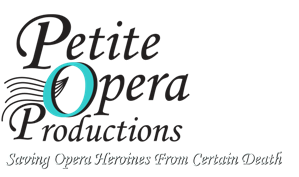 Petite Opera holds general auditions January 22, 23, 2011 for its 2011 season, consisting of its original spoof operetta (back by popular demand) Al Fresco, Life Through Opera-Colored Glasses (May 6-22), and Amahl and the Night Visitors (Nov-Dec 2011). Auditions are by appointment only. Trained Adult vocalists for cover roles. Prepare two selections from opera or operetta. One must be English. Cover roles are guaranteed one performance. Comic actors to cover the lead role of Al Fresco. Prepare one, 1-minute comic monologue, and be prepared to read from the script. Cover role is guaranteed one performance. Trained Adult vocalists for principal roles. Prepare two selections from opera or operetta. One must be in English. Boys and Girls, age 9-13, to play the principal 10-year-old boy, Amahl. Prepare one selection from Amahl, or two opera, operetta, or classical selections in English. Adult and Children for chorus roles. Prepare the appropriate vocal line from the Amahl "Shepherd's Chorus", or perform one similar classical selection, in English. All ages are encouraged to audition. All individuals who audition must be able to read music, have the ability to learn their part quickly (rehearsals are limited), must have reliable transportation, and must be prompt to rehearsals. An accompanist will be provided. All individuals should bring their own sheet music. All performances are in English. No housing is provided; local talent only. Petite Opera will do its best to accommodate date and time requests. Role descriptions, schedule audition date, time and location information will be sent via email.